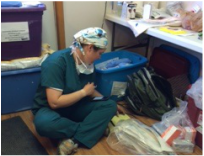 Services - Alaska Rural Veterinary Outreach, Inc.
A primary focus of our mission is Spay (females) and Neuter (males) surgery. It is the most humane and effective way to guarantee that your dog won't have more litters. Neutered males are less likely to be aggressive, roam, and won't constantly fight with other male dogs around in-heat females. One intact male can impregnante many intact females. One intact female can produce 2 litters a year, and litters can be as large as 12 - 14 puppies. ARVO can provide Rabies vaccines as needed. This vaccine will help protect against Parvo, Distemper and other serious and potentially fatal diseases that can spread from pet to pet. Parasite infestation (worms) may not seem important, but can lead to serious health problems in pets. Animals that eat a lot of raw fish or game may be especially susceptible to Tapeworms. Nails that get too long can interfere with proper bone alignment, resulting in abnormal mobility, pain and lameness. ARVO will trim nails and show owners how to do it themselves on a regular basis. Our vets can humanely put to sleep companion animals for health/quality of life and age reasons. Basic health checks are available. If a pet has a more serious health problem that cannot be safely treated in a rural setting, ARVO can assist the pet owner to send the animal to Anchorage for treatment. Alaska Rural Veterinary Outreach, Inc.